As new commercial and industrial technologies emerged and grew, so did the use of sputtering as a technique for deposition thin films of desired characteristics. The Perkin Elmer 4400 and Perkin Elmer 2400 Series sputtering systems were designed to meet the changes of this changing technical environment, whether in development or production. Condition: Used. We sell them at AS IS,WHERE IS condition. Refurbished or Refurbished&Upgraded are optional at extra cost and time. Lead Time: Immediately after receipt of payment. Warranty: No warranty for the AS IS,WHERE IS condition. Perkin-Elmer Sputter System Information for your reference only. With an installed base of more than thousands of systems, Perkin-Elmer was a leading supplier of sputter deposition equipment for high technology application in 1990’s. 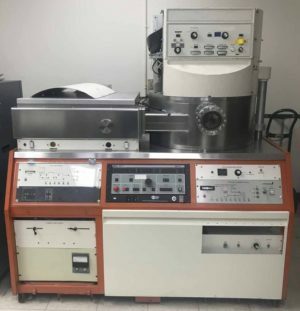 The Perkin Elmer 2400 Series sputtering systems were used not only in the production of semiconductor devices but also in the development and manufacturing of thin film recording heads, thin film resistors and capacitors, optical coatings, gallium arsenide lasers and fiber optics. Quality, performance and stability backed by more than two decades of experience in vacuum technology and UHV design were built into every Perkin Elmer sputtering system. The Perkin-Elmer4400 and Perkin-Elmer 2400 Series were designed for flexibility offering a wide range of operating and process modes. The highest quality construction and components assure reliable operation and an ultra clean vacuum environment to yield consistently reproducible results. Every Perkin Elmer sputtering system was supported by years of technological experience and backed by a worldwide sales and service organization dedicated to prompt courteous service. 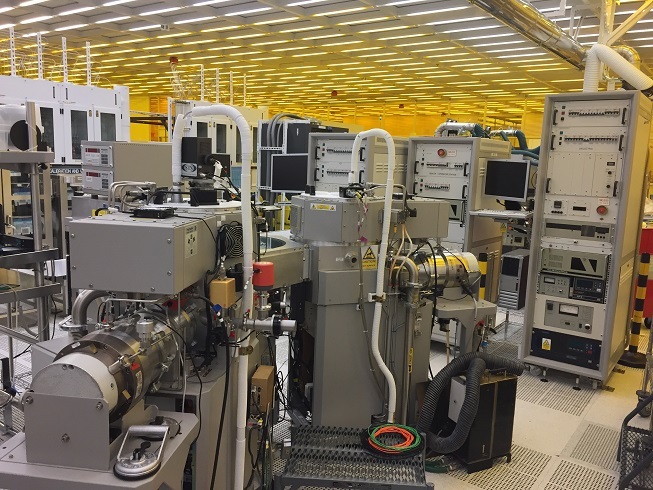 The Perkin Elmer4400 and Perkin Elmer2400 Series of sputtering systems represent just one part of the Perkin Elmer Semiconductor Equipment Group’s unique “one source” approach to cost-effective VLSI production. From mask making to photolithography, dry etching and sputtering deposition, the Semiconductor Equipment Group provides an integrated line of performance-proven production equipment specially designed to address each critical process. This “one source” solutions designed to meet the semiconductor industry’s demands throughout the 1980’s. The Perkin Elmer 4400 Series, designed specially for high throughput production environments, features a high capacity load lock and a broad range of operating models to accommodate virtually any thin film coating requirement. The Perkin-Elmer4400 Series fast cycle load lock, cryogenic pump, and full flood Meissner trap ensures quick turnaround on batch loads. High throughput are achieved for a full range of substrate sizes and shapes. A rotating substrate table for multi-pass deposition helps assure high uniformity and run-to-run repeatability. Simplicity of mechanical design with a minimum number of moving parts in the process chamber minimizes the generation of defect-causing. Easy loading pallet designs reduce wafer breakage. Consistently clean vacuum conditions assure reproducible high quality films. The Perkin-Elmer4400 Series provides a broad choice of target materials, machine operating models, pressure and gas controls, cathode configurations and power levels. Operating models include DC magnetron, RF magnetron, RF diode, bias sputter, reactive sputter, co-sputter and RF etch. 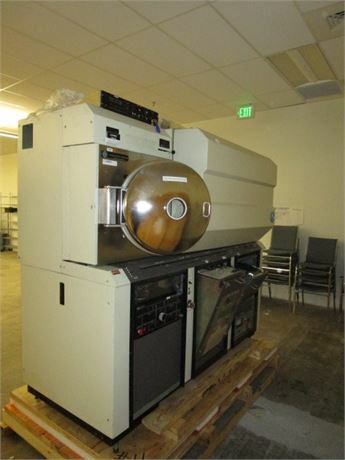 The Perkin-Elmer 4400 Series systems yield excellent films for a wide variety of materials including aluminum alloys, platinum silicide, titanium-tungsten, nichrome-gold, silicon nitride, silicon dioxide, precious metals and permalloy. No single cathode design can effectively meet the varied needs of different users or even the possible multiple needs of one user. Every film requires an optimum combination of target material, size, and shape for its most efficient fabrication. Recognizing these realities, the Perkin Elmer 4400 Series provides two distinct cathode configurations: 8″ circular and delta-shaped. A general purpose sputtering system employing up to three 8″ diameter circular cathodes in DC magnetron, RF magnetron, or RF diode configurations. Power options are available up to 2 kw RF and 5 kw DC. A delta target sputtering system designed for high rate deposition of metals and metal alloys. The Perkin Elmer4410 is also adaptable to the deposition of dielectrics and employs up to three delta-shaped cathodes in DC magnetron, RF magnetron, or RF diode configuration. Power options are available up to 3 kw RF and 10 KW DC. A delta target sputtering system, similar to the Model Perkin Elmer4450 with load lock pumping and heating incorporated as standard features. A delta target sputtering system of identical design to Model 4480 but including cassette-to-cassette loading as a standard feature. As VLSI geometries routinely approach the one to two micron region, new problems arise in thin film deposition technology, dry etched vertical walls, deep vias and multiple level structures must all be uniformly covered with no microcracks or cusping. Film deposition systems must be able to provide uniform conformal coverage of these tightly packed structures to minimize interconnect resistances and maximize yields. Substrate heating has improved step coverage of LSI structures by increasing the surface mobility of the depositing atoms. Additional techniques are now being used to further enhance coverage of planar-magnetron-sputtered films. Perkin Elmer 4400 and Perkin Elmer 2400 Series sputtering systems utilize “multi-pass” design and RF bias to maximize film coverage of VLSI structures. As geometrical features get smaller, new materials will be employed. Metallization layers now include the use of diffusion barriers and low resistance gate and interconnect materials such as refractory metal silicides. By utilizing rotating substrate table, Perkin Elmer sputtering systems allow wafers to be coated by multiple passes through the target region. This technique can minimize shadowing effects sometimes encountered in the single pass mode or center-to-edge effects found in static deposition systems, while maximizing target material utilization, step coverage and device yield. The application of RF bias to the substrate re-sputters deposited material from horizontal surfaces onto the surrounding vertical walls of the wafer. Step coverage of 50% or more can be achieved on vertical steps and deep vias can be uniformity covered with RF bias and multi-pass technologies. The deposition of contamination-free, low-resistance refractory metal silicides request the use of the purest materials. Co-sputtering provides the optimum method for depositing these films from pure elemental targets, wile providing a convenient means to control the stoichiometry of the films. Oxygen and carbon contamination and target-to-target stoichiometric non-uniformities are minimized using dual target sputtering and multi-pass techniques. The Perkin Elmer 4400 Series high capacity load lock system eliminates the need to break vacuum; thereby reducing both pumpdown time and contamination of targets and internal chamber surfaces. Transfer of a full pallet load of wafers from air to the process chamber and pumpdown to a base pressure of 5X10-7 Torr can be accomplished in less than 3.5 minutes. The process chamber vacuum system incorporates a contamination-free, closed cycle, two-stage helium cryopump (turbomolecular pump optional). Under load conditions, 70oK is maintained in the first stage and less than 15oK in the second stage. This assures efficient, rapid pumping of most atmospheric gases and reduction of partial pressures of most unwanted gas species to acceptable levels. An ultimate vacuum of 10-6 scale can be attained with typical pumping speeds of 1000 l/s for nitrogen, 1100 l/s for hydrogen and 4200 l/s for water vapor. A full flood Meissner trap mounted in the process chamber maintains an efficient pumping speed for water vapor of 30,000 l/s during deposition or sputter etching. The Meissner trap pumps water vapor at a maximum rate even with the high vacuum cryopump throttled. This assures good quality films in critical processes such as the deposition of aluminum alloys. The Perkin Elmer 4400 Series systems can be equipment with load lock heating and turbomolecular pumping to degas substrates prior to processing and minimize pumpdown for critical processes such as the deposition of aluminum alloys and other oxidizable metals. This further reduces the partial pressure of undesirable gases such as water vapor. All Perkin-Elmer 4400 Series systems are equipped with ion and thermocouple gauges. A wide-range gauge controller monitors and digitally displays vacuum levels from 10-11 to 200 microns providing continuous monitoring of operating pressure. Additional thermocouples provide inputs to the automatic pumpdown control and automatic lock control. Model 4400 is designed for use in production environments or process development. 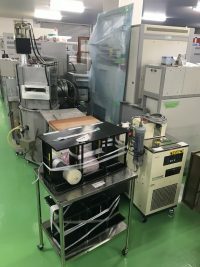 Up to three 8-inch circular cathodes and a 350oC quartz lamp heater may be installed in the process chamber to accommodate a variety of processes. An optional RF power sputtering network enables the RF/RF Co-deposition of two different materials. Precise stoichiometries of graded interface may be easily achieved. The Model 4400 is routinely used for such processes as the deposition of Cr-Co for recording discs, Cr-Cu for backside metallization, TaSi2 for gate metallization and Si3N4 for interlayer dielectric. A precise ratio of chrome to cobalt is readily achieved with co-deposition using the RF power splitting option, ideal film temperature in the range 170 oC-200 oC can be easily obtained for optimum grain growth and orientation. The films resulting from the sputter deposition of chrome-gold are superior to those obtained from evaporation processes, pre-etching prior to deposition removes native oxide improving film adhesion and RF magnetron deposition results in lower thin film temperature and less gold interdiffusion. Tantalum silicide of any desired stoichiometry is easily deposited with co-sputtering using the RF power splitting module. Annealed film resistivity of approximately 2.3 ohms per square can be obtained from a typical 2000 angstrom film of tantalum silicide. Within further advances in process technology, the UHV design of the 4400 will enable it to accommodate the deposition of refractory metal silicide films of even higher resistivities. With RF bias deposition, silicon nitride films exhibiting low pin-whole count, good step coverage and low stress can be readily deposited in the model 4400. The two-way adjustable RF Power Split Module provides precise control of the level and ratio of RF energy from a single RF generator to two 8″ diameter cathodes simultaneously. A total of 2 kw may be applied with power ratio adjustable between 5% and 95%. This module is idea for use with the Model 4400 and 2400-8SA in R&D and in low volume production applications, where precise control of alloying of film properties is desired. The Perkin Elmer Delta cathode systems(Model 4410, 4450, 4480) are ideally suited to aluminum alloy deposition for gate contact and interconnect metalization. A Delta cathode system achieves an instantaneous deposition rate for aluminum alloys of 12,000 angstroms/minute. The substrate pallet can be in excess of 200 angstroms/kw minute with sputtered material utilization approaching. Delta cathode systems maximize uniformity of deposition, exhibiting a +/-7% uniformity over a 6″ annular width. Optional high performance Delta cathodes yield a uniformity of +/-5% over a 73/4 inch band, allowing processing of up to 22 100mm wafers per cycle. Standard Delta cathodes process 50-60 100mm wafers per hour while optional high performance Delta cathodes yield throughput in excess of 80 100mm wafers per hour. 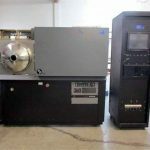 A particular advantage of a circular batch sputtering system is its adaptability to different substrate sizes. The Model 4410 and other delta cathode systems can easily handle substrate size up to 8 inches in diameter. Standard wafer size of 3 inch, 100mm, 125mm and 150mm can easily be accommodated. Perkin Elmer sputtering systems ensure low film resistivity by minimizing partial pressure of oxygen and nitrogen below 1X10-7 Torr. With total system background pressure of 5X10-7 Torr and an instantaneous deposition rate in excess of 8500 angstroms/minute, near-bulk resistivity for aluminum alloy films can be achieved. By keeping oxygen content below, film hardness for typical 1 micron thick aluminum silicon films can be kept below 100 kg/mm2 after annealing at 500oC, minimizing bonding failures. High quality aluminum alloy films of 70-90% relative reflectance are routinely produced in high rate DC Delta magnetron systems, yielding wafers easily accommodated in today’s projection mask aligners. Optional load lock pumping and wafer degassing further minimize water vapor and hydrogen, the principal contaminants that contribute to hillock growth and poor specularity. As metallization films become thicker and specularity degrades, further reduction of unwanted gases can be achieved through the use of supplemental hydrogen getter pumping in the Model 4410 and other Delta cathode systems. The high rate sputtering made possible with Perkin Elmer Delta DC magnetron cathodes produces sufficient heat to maintain film temperature in the ideal range. Heating the substrate in this manner and re-sputtering the deposited material through RF bias improves coverage of vertical surfaces in VLSI structures. It also minimizes cracks and cusping. Provide more uniform deposition over a wider annular region of the pallet. A maximum of twenty two 100mm wafers can be loaded yielding 50% more throughput for a typical metallization process. The HIGH THROUGHPUT option consists of a modified shaping aperture, a high performance Delta cathode and a pallet nested for twenty two 100mm wafers. The region of high uniformity is extended across the total 8″ annular width of the pallet. A uniformity of +/-7% is achieved across a 73/4 inch band suitable for mounting two concentric rows of 100mm wafers. This wide brand of uniformity means that 51/4“, 8″, or 14” recording discs can be accommodated in the system. The Delta Cathode Dual Deposition Sputter Module, operable in either a dual DC mode or DC and RF mode, is designed for higher throughput and larger scale production. Separate power suppliers allow independent application of either DC or RF energy to two delta cathodes simultaneously. The dual deposit sputter module for Models 4410, 4450 and 4480 is the choice for co-sputtering of refractory metal silicides for VLSI circuits. The dual deposit sputter modules and the co-sputtering technique allow the deposition of contamination-free films. * Assumes 10 minute pumping, wafer exchange and venting cycle, some processes require pre-heating, extending the loading cycle by as much as 5 minutes. (Annealed)85kg/mm2100kg/mm2120kg/mm2CV Shift0.25V0.15V0.15V*Uniformity+/-7%+/-7%+/-7%* Typical results with Standard Delta Cathodes. Higher uniformity and throughput can be achieved with high performance Delta Cathodes and high throughput option. Throughput is process dependent and may vary depending on etch and pre-heat cycles. In a laboratory or low-volume production environment, where the high throughput levels of the 4400 Series are not required, the 2400 Series is the ideal alternative for high quality sputtering in a wide variety of applications. 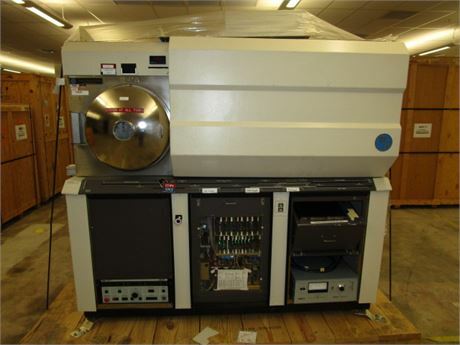 The Perkin-Elmer Model 2400-8SA features a large 211/2” rotating, water cooled annular table with a capacity of sixty-four 2″, thirty 3″, or thirteen 4″ wafers. Used in conjunction with a cathode shaping aperture, the rotating table permits high uniformity. A 4″ wafer vertical range of the table facilitates coating bulk substrates. As an added feature, up to three 8″ round cathodes may be specified allowing sequential deposition from several targets or alternately, static deposition or heating from any target position. Power Splitting is an optional feature of the 2400-8SA system. With this feature, RF power can be applied to two cathodes simultaneously in any desired ratio from 5 to 95%. Combined with the continuous substrate rotation feature, an infinite number of alloy compositions can be developed simply by varying the power division between target. The Model 2400-8L load lock system ensures a constant inert gas or vacuum environment allowing rapid pumpdown to base pressure and elimination of target pre-cleaning. High partial pressure of water vapor is no longer a problem, even in areas of high humidity. Additional water vapor pumping is possible with an optional Meissner Trap. By eliminating the need to break vacuum in the process chamber, the 2400-8L load lock reduces both pumpdown time and contamination of targets and internal chamber surfaces. Load lock pumping is provided by a mechanical pump which is shared with the process chamber vacuum system. Load lock pumpdown and pallet transfer are automatically controlled. Sequence and valve position are displayed on front control panels. A water-cooled 8″ diameter substrate table rotates the pallet 360o and automatically aligns it precisely under any one of the three targets or the etch position. Substrates can be loaded, processed, and unloaded in minutes improving run to run yields. A full pallet of wafers can be transferred from air to a properly maintained process chamber and pumped down to a base pressure of 5X10-7 Torr in less than five minutes. Careful cathode and chamber designs mean high uniformity,. Integral copper channels in the anode tables insure even distribution of cooling water and RF power. The 2400-8SA features a 211/2” table which enables processing of large wafer batches. The 2400-8L utilizes a smaller pallet but provides a unique load lock system to dramatically reduce pump-down time. Either approach maximizes efficiency. Both 2400 Series systems offer a wide choice of target materials, machine operating models, and gas controls with capability to perform a variety of thin film tasks. The Perkin-Elmer 2400 Series RF Bias capability enables high quality films with a variety of materials. The RF bias provides improved step coverage, controllable intrinsic stress for metal or dielectric films, improved alloying materials and stoichiometry, resistivity that approaches bulk values, precisely controlled film densities and impurities and reduced argon content. The 2400-8SA and 2400-8L use uniformity shaping apertures to compensate for the geometry of the cathode sputtering pattern. The rotating substrate table further improves uniformity in the 2400-8SA. The 2400-8L utilizes a double-disk dark space shield to eliminate edge sputtering from the cathode plate and provide exceptional plasma confinement. In all 2400 systems, the mode selector switch provides a choice of modes:sputter deposit, bias sputter and sputter etch. Servo-Match automatic turning maintains proper turning despite variations in target emission, pressure or RF power. A power stabilizer holds RF power constant. Fast turnaround through automated operation. 2 stage cryopump with 1000 l/s pumping speed for air, including chevron, water-cooled compressor and lines, automatic regeneration controller and plumbing kit. Diffusion-pump system including 1500 l/s oil diffusion pump, LN2 chevron baffle, water-cooled baffle and water-flow switch. Ultek’s microprocessor controller option permits automated control of machine functions and process parameters including load lock operation, pump-down venting and all process sequences. Up to five 16-step process sequences can be stored in the system’s memory to facilitate process change. An interactive CRT facilitates programming. Unconditional looping is available for repetitive processes. Other capabilities include: program listing, hard copy records and interface with other computer systems. Perkin-Elmer’s Model 4410 delta cathode production sputtering system is designed for high yield in production environments demanding maximum throughput for metal deposition. It also provide a high level of flexibility in process control for other materials. The 4410 uses a delta-shaped cathode that eliminate the need for a large-area uniformity-shaping aperture. This dramatically increases throughput while maintaining high wafer-to-wafer uniformity. Contrasted with circular cathodes, target utilization is substantially higher. Up to 35% of the target can be sputtered before target change, and some 60% of the sputtered material actually reaches the substrate pallet. This results in a lower cost per wafer and less frequent target changes. Up to three delta or 8-inch round targets may be installed for sequential deposition of three different materials without breaking vacuum. The 4410 employs a fast cycle load lock, two-stage cryopump and full flood Meissner trap to maintain the process chamber at high vacuum and in a clean condition at all times. The process chamber is fabricated of stainless steel for contamination-free performance. A base pressure better than 5 X 10-7 Torr is achieved within 3.5 minutes from loading substrates into the load lock. Typical cycle time, with optional load lock heating and pumping, is 12 to 15 minutes for the deposition of 1 micron of aluminum. 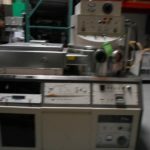 High rate delta DC magnetron sputtering: Aluminum and aluminum alloys can be sputter deposited at rates in excess of 1800 Å /min, with loads of thirty 3-inch or thirteen 4-inch wafers. High throughput operation: Automated load lock and controller sequences provide for efficient pump-down and pallet transfer to process chamber, maximizing throughput. High uniformity: +/-7% deposition uniformity guaranteed with water-cooled rotating annular substrate table;+/-5% achievable. The right sputter mode for each application: Sputter deposit, 0-10% RF bias sputter. DC bias sputter, sputter etch to 2 kw, RF magnetron, RF diode, DC delta magnetron. Ultra-clean vacuum: Cryopump and Meissner-trapped process chamber ensures contamination-free conditions especially important for critical processes such as the deposition of aluminum and platinum. Designed for operator safety: Two-button operation initiates pump-down and load sequence. Safety interlocks on DC and RF suppliers. Easy maintenance: Removable deposition shields permits easy system cleaning. Automatic cryopump regeneration minimized downtime and inconvenience. Key function clearly displayed: Valve position and system status are continuously displayed by quick-reading LEDs on front panels. Easy wafer loading: Tweezer grooves facilitate wafer loading. Nested pallets are optional. A fail-safe system: Water flow switches on cathodes, matching network and vacuum system automatically shut the system down in case of cooling system failure. 4400-Series Production Sputtering Systems perform a number of sputtering process, each of which is ideal for a different application. Share the post "Perkin-Elmer 4450"